Welcome to our blog page here at Lake Montessori school in Leesburg! With spring here and summer just around the corner, we’re not only staying busy with our Montessori school daily routines, our after-school programs, and our extra-curricular activities, we also are gearing up for our amazing summer programs through our Camp Montessori! For a fantastic educational option that will offer your child an environment in which they can thrive, consider signing them up for school at Lake Montessori! We accept students in Pre-K, elementary school, middle school, and even high school. Contact us today to schedule a tour of our facility or to fill out an application. The problem with so many Americanized educational institutions is that it seems as though every curriculum is based around the idea that your child is supposed to conform to one learning style and if that doesn’t appear to be working, something must be wrong with your kid. This one-size-fits-all approach to education has been something that we at Montessori simply can’t tolerate. The Montessori Method says that every child is unique and as such, should be taught in the way that is most effective for them. Lake Montessori makes it our business to provide all of our students with individualized teaching, learning by experience, a safe and loving environment, and the confidence that comes when children are allowed to learn at their own pace. Since we proudly stand behind the Montessori Method, and we’re partnered with the American Montessori Society, it should be no secret that we love everything about Montessori. But if you don’t know what’s so great about what we do, this blog is for you! In today’s article, we’re going to take a look at four reasons why a Montessori education is right for your child! 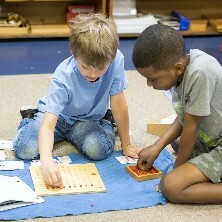 Everything about the Montessori classroom, from the way it’s set up to the way that it’s run, speaks to our emphasis on “doing for yourself.” Montessori students are encouraged to be independent in the way that they learn the material, the way that they perform everyday tasks, and the way that they take responsibility for their own actions. Inside our safe and controlled environment, students, even at a young age, are given the tools to take their education into their own hands. We’ve seen excellent results from our Montessori Methods and we love seeing our students become well-rounded and competent adults. So often in a standard educational environment, students are lectured from a book, given hours of homework, and tested on the material, often without ever really understanding why it is valuable knowledge. With Montessori schools, we work hard to ensure that students can get behind the reason for each of their educational aspects. When kids can comprehend the “why,” their minds will more easily and fluidly latch on to each concept. 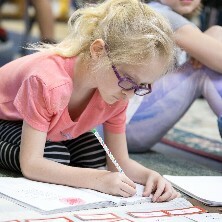 One of the best and most successful things about a Montessori education is that we provide teaching that is individualized for every student in our classrooms. Since every kid learns in a different way, we work hard to cater to these different learning styles to better ensure that every child feels accepted, valued, and most of all, that every kid learns. With our education style, Leesburg Montessori students are allowed to work with their hands, learn by doing, and work in an atmosphere that encourages teamwork and comradery. Your child will love our blended classrooms that have students of different ages, (something that we’ve had amazing success with) and they’ll feel accepted and cared for in all of their endeavors. No matter how your child learns, there is a place for everyone at our Leesburg Montessori school! We are passionate about what we do and we consider the molding of young minds the most important and valuable cause there is. Started by Maria Montessori over a hundred years ago, the Montessori Method has been proven in countries all over the world and its success rates have been celebrated for decades. If you’re interested in taking a tour of our amazing facility or if you’re interested in filling out an application, contact Lake Montessori today to get your child on the right educational path!